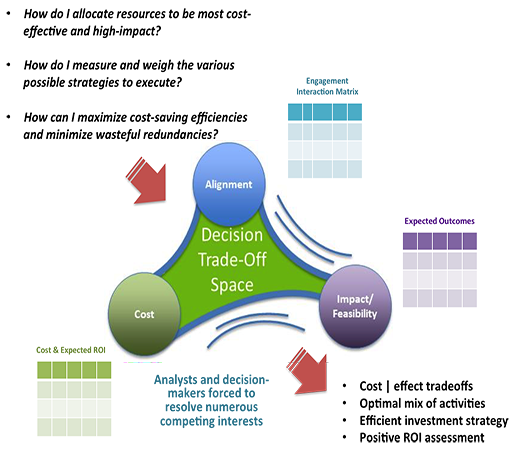 NSI has used decision analysis in support of numerous client initiatives to provide systematic assessments and comparisons of complex trade-offs and priorities across multiple decision criteria including cost, feasibility, impact, and risk. NSI developed a prototype decision analysis tool termed Holistic Engagement Activity Ranking Tool (HEART) to help planners and analysts from Africa Command (AFRICOM) assess and compare various command engagement activities over multiple decision criteria. 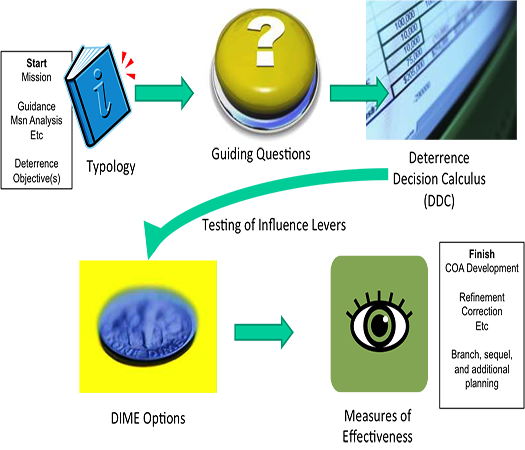 Aligning resources to strategy is imperative for overall mission success; however, without a framework and standard measurement schema it is difficult, if not impossible, to calculate the relative value of different engagement activities, as well as the trade-offs involved in changing priorities and activities. To address this, NSI developed HEART as an evaluative tool to analyze and optimize AFRICOM engagement resources to national and Command objectives while retaining the flexibility to monitor and adjust to rapid changes in political-military environments and/or the priorities. NSI led an effort to capture concepts and analyses of nuclear strategy requested by US Strategic Command (STRATCOM). The purpose for the project was to examine relevant concepts and utility of alternative analytic techniques for assessing the sufficient nuclear force structure and posture to provide stable deterrence, assurance, defeat and proliferation security as the US progresses toward a reduced force size. 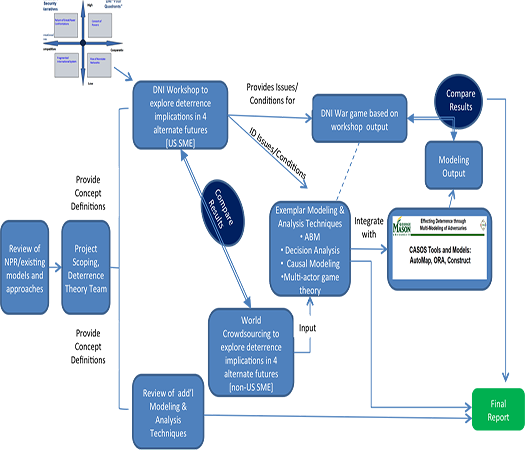 As part of this effort, NSI developed two prototype decision analysis tools to support a deterrence problem, namely, the Decision Analysis Tool (DAT) and the Attributes Trade-off Model (ATOM). The DAT tested the sensitivity of assessed actors’ preferred options to decision making heuristics and risk-propensities, while the ATOM analysed trade-offs between force posture attributes, US policy objectives, costs and risk, and impact of posture changes on each. 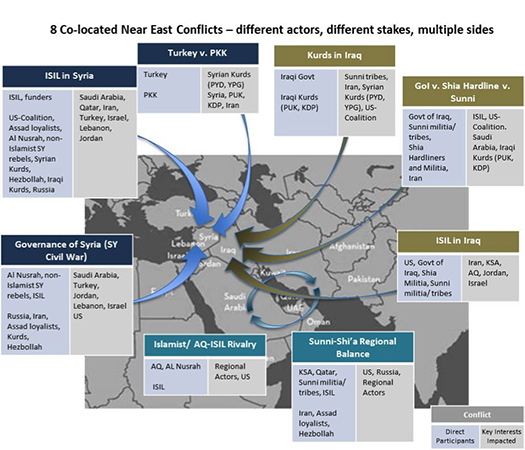 NSI explored the dynamics of the central Middle East conflict system. Specifically, we described the system and why it is critical to assess US security interests and activities in the context of the entire system rather than just the conflicts (e.g., defeat of ISIS) in which the US is most interested. We applied a decision analysis approach to assess regional dynamics and regional futures based on the alignments and conflicts among three critical drivers: actor interests, resources and resolves. And finally, described the interplay of the 20-plus actors’ interests, capabilities and resolve in the eight conflicts that comprise the system. The goal is to facilitate systematic analysis of the sources of threats to US security beyond ISIS so that we might work pro-actively, or “farther to the left” to mitigate them. We also participated in a short term proof-of-concept effort to evaluate neuro-cognitive maneuver engagement options in the narrative space with three objectives: to disrupt ISIL leadership’s ability to command and control forces; to neutralize their ability to maintain or increase moral, political, and financial support and recruit foreign fighters; and ultimately to psychologically isolate ISIL leadership from one another and their respective constituencies inside and outside of the organization. As part of this effort, NSI performed decision analysis of key regional actors and population groups to identify key actors interests, capacity and resolve, and assess how they respond to various stimuli from various actors. NSI participated in an effort for USSTRATCOM to aid deterrence planners and analysts in identifying the information about an adversary, whether state or non-state, needed to produce “greatest confidence” options for deterring the adversary from acting in contravention to US national interests. 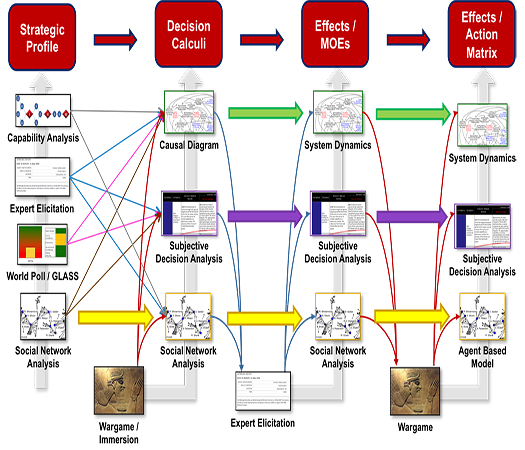 As part of this effort, NSI developed a strategic decision analysis framework with the objective to decisively influence an adversary’s strategic decisions by shaping his perception of benefits and costs of hostile action and his perception of the costs and benefits of inaction. Our efforts also focused on developing methods for STRATCOM and its partners to sufficiently understand a specific adversary’s decision calculus, and employ a rigorous, well-defined, yet tailorable approach to identify potential deterrent actions and understand the potential impacts of those actions for both state and non-state actors. NSI provided STRATCOM with a strategic deterrence decision analysis framework for 21st century state and non-state threats by exploring the utility of various deterrence models and simulation methods, how wargaming can contribute to an understanding of adversary decision making and add value to existing deterrence products, and the applicability of different models to improve the analytic foundation of strategic deterrence planning. We also explored how the strategic deterrence decision analysis framework could be enhanced with modeling and simulation, triangulation and iteration of multiple methods, and wargaming can complement one another and generate new (combined) insights as well as improve rigor and thereby reduce uncertainty and risk and increase confidence to ultimately enhance deterrence assessments and analysis.